Just 25 years ago, Boston Harbor was a national disgrace, as our waste washed up on the beach and shore from Cape Cod to Cape Ann. Working together we changed all that. Today, Boston Harbor, Boston's waterfront and the Boston Harbor Islands are civic assets for all Bostonians, the region's residents, and visitors to enjoy. 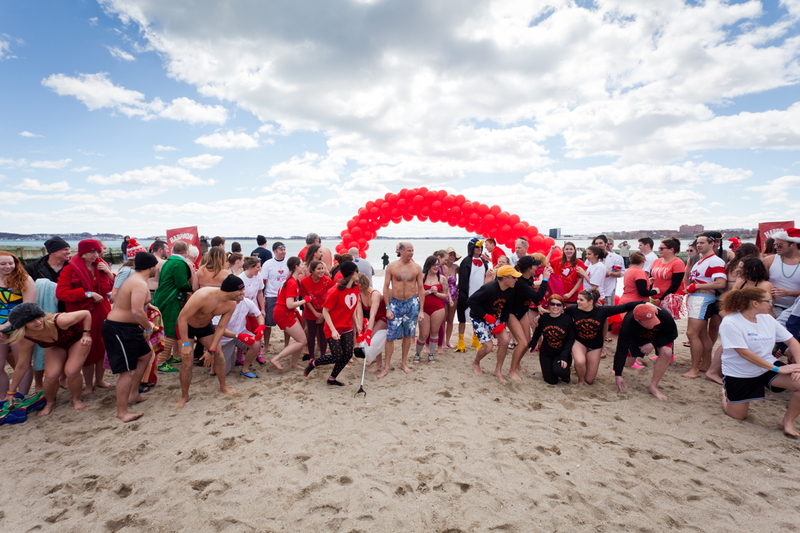 And, thanks to the remarkable success of the Boston Harbor Clean-up, Boston Harbor is now home to some of the cleanest urban beaches in America! 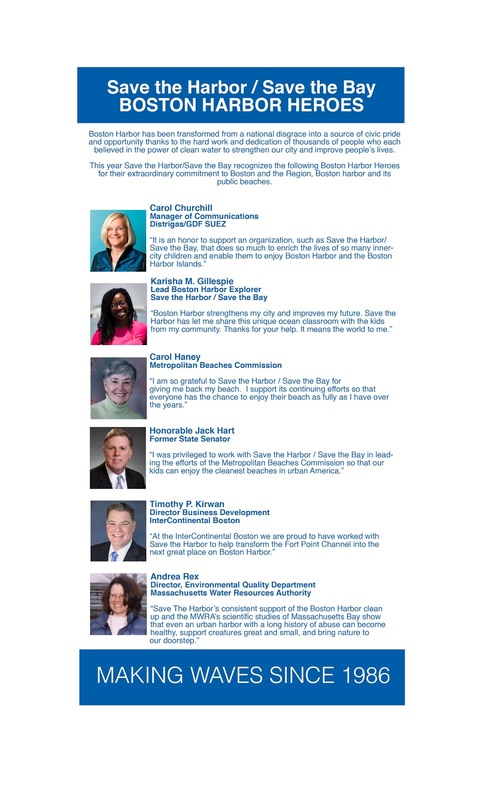 None of this would be possible without the hard work and dedication of thousands of people who each believed in the power of Boston Harbor to change lives and transform communities. During our 25th anniversary in 2011, Save the Harbor established an annual tradition of recognizing Boston Harbor Heroes (http://www.savetheharbor.org/heroes/) for their extraordinary commitment to the harbor we have worked so hard to restore and protect at our annual corporate gala, "Destination Boston Harbor"
EEA Secretary Richard K. Sullivan, Jr. 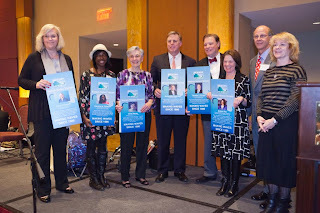 The 2012 Harbor Heroes included Lowell Richards of MASSPORT, Professor Charles Haar of Harvard University, Harold Sparrow of the YMCA of Greater Boston, Ronda Ivy McLeod of JetBlue Airways, and Will Clark, Co-Chair of Save the Harbor's Youth Committee. On Thursday, March 28, Save the Harbor/Save the Bay honored six new Boston Harbor Heroes at their Destination Boston Harbor gala event at the InterContinental Hotel. They were recognized for their extraordinary commitment to Boston Harbor’s revitalization, its future, and its impact on the community. 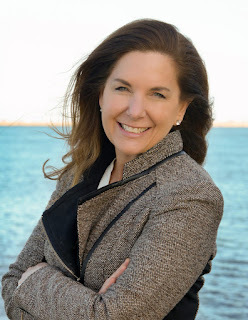 Carol Churchill, of Distragas GDF/Suez - For her support of efforts to connect the region's youth and teens to Boston Harbor and the Boston Harbor Islands. Karrisha Gillespie - For her extraordinary work to share the harbor with young people from every neighborhood in the city as a Boston Harbor explorer. Carol Haney - For her leadership in the restoration and revitalization of Revere Beach. Jack Hart - For his leadership as a State Senator and Chairman of the Metropolitan Beaches Commission in restoring the region's public beaches from Nahant to Nantasket, and making the beaches of South Boston some of the cleanest urban beaches in America. Timothy Kirwin - For his generosity and the work he has done to strengthen the harbor and the city by helping to transform the Fort Point Channel into a destination for residents and visitors alike. Dr. Andrea Rex - For making sure that all of us have the facts we need to make good decisions, and for insisting that good policy be based on good data and sound science. Thanks to them, and to all Boston Harbor Heroes! 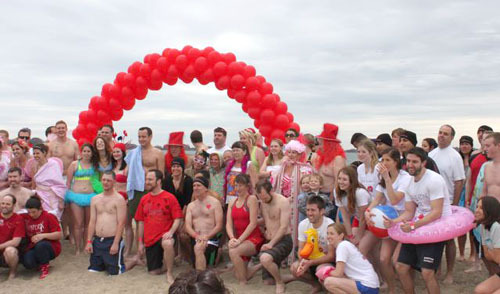 They came (in costumes), they donated, they splashed. Because they love our beaches! On Saturday, about 200 splashers braved the icy waters and raised more than $30,000 to support free events and programs on our region's public beaches from Nahant to Nantasket this summer. "What a fantastic way to spend the first Saturday of spring, with a refreshing dip and a fresh Harpoon on one of the cleanest beaches in America with Matt Light, Kennedy Elsey and our friends from Save the Harbor / Save the Bay" said Dan Kenary, Co-Founder of Harpoon Brewery. The fun kicked off even before the dip in the frigid Atlantic, as Matt Light, the former Patriot's All-Pro, and Mix 104.1's Kennedy Elsey, judged a very competitive and spirited costume contest. 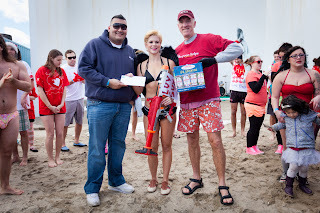 The winner, the lovely Ms. Anti-Cupid, received a FREE roundtrip ticket from our partners at JetBlue Airways, who were on-hand to donate the prize. with this year's winner, Heather Foley - the Dark Angel. Backed by the rocking sounds of The Siracusa Project, the party continued after everyone splashed, with guests enjoying a cold Harpoon and some delicious Tasty Burgers. perfects his sand painting technique on the beach. This year's splash raised $30,000 to support sand sculpting competitions, concerts, family reading nights and festivals on the region's public beaches in Nahant, Lynn, Revere, Winthrop, East Boston, South Boston, Dorchester, Quincy and Hull. And after the final tally, we want to thank and congratulate South Boston's Bob Dougherty for being this year's top fundraiser with $1,585! Mr. Dougherty received a free roundtrip ticket from our partners at JetBlue Airways. Thanks to everyone who made this such a great event. It really "wetted" our appetite for what is haping up to be a great summer beach season. P.S. - It is not too late to make a contribution to support this year's splash. Just visit www.cupidsplash.com and follow the links. Hey you Save the Harbor Save the Bay followers! This is Karrisha Gillespie reporting live! So I have experienced a lot of new changes since this past summer: I am now a sophomore at The Kents Hill School, and I was honored with the title: Boston Harbor Lead Explorer 2012! I am currently on Spring Break, which is why I am writing this blog! I will be working for Save the Harbor for the next few weeks then I will be off to study abroad in England! I am SO excited to be back in the office, but even more excited to be out and about with all of Boston Harbor Explorers! 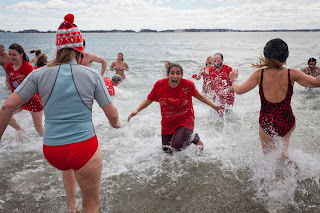 Why Do We Splash on March 23? 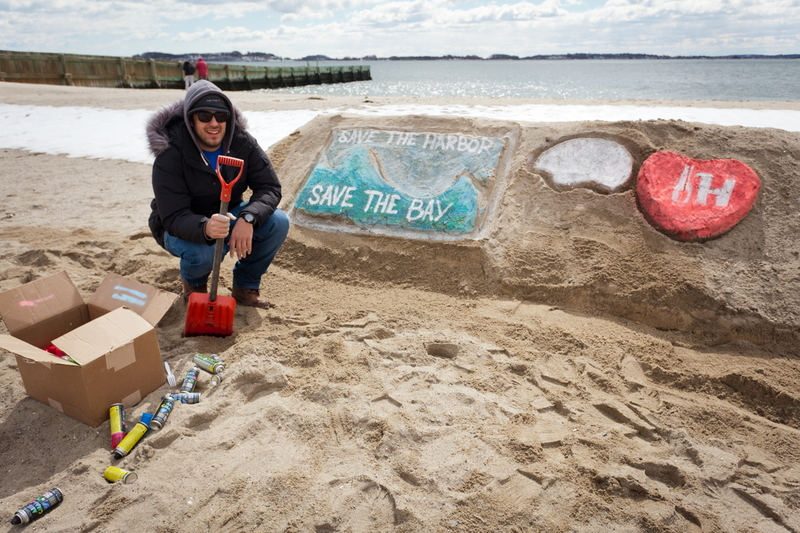 to benefit Save the Harbor / Save the Bay. up on the beach and shore from Cape Cod to Cape Ann. Boston Harbor and Mass Bay. As a result, Boston Harbor has been transformed from a "Harbor of Shame"
into a source of recreational opportunity and civic pride. 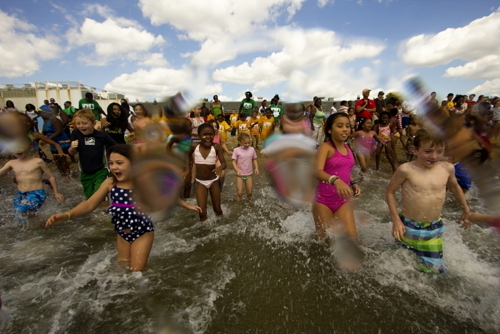 of South Boston are among the cleanest urban beaches in America! and awesome gifts from Harpoon Brewery. The fun is important, but the fundraising piece is important as well. to Cape Cod or Cape Ann in the summer. South Boston, Dorchester, Quincy and Hull. or make a small donation to support your splash. and to the region's kids and families. We hope to see you on the beach on Saturday! you can still come to the party.